Enter '37637X' for the Conference ID, your email address, and choose a new password. Continue to enter information as prompted. Enter 37637X for the Conference ID, your email address, and enter the password you used for your old account. When you click 'Login', you’ll receive an error saying you need to set up an account. Simply click 'Continue'. By entering your previously used email address and password combination, you will enable your old account for access to this new conference. Enter 37637X for the Conference ID, email address and password. 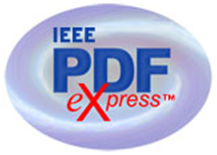 It is important to note that submitting a file to IEEE PDF eXpress in only for creation of a compliant PDF file, you must still submit your final paper through online submission. Option 1 Submit your source file for conversion PDF Check, or by clicking Try again, then Submit Source Files for Conversion. Resubmit your source file with corrections (Try again, then Submit Source Files for Conversion) Submit your IEEE Xplore compatible PDF to the RCIS'16 Conference Management Website.